IN THE dead of night on January 7, two earthmoving vehicles were seen moving up the forest road of Niyamgiri Hills. Villagers of Semalbhatta were quick to conclude that the heavy vehicles were from the nearby Lanjigarh refinery owned by Vedanta Alumina Ltd. They alerted nearby villages. By 3.30 am a crowd of 800 people gathered to form a human wall and stopped the heavy vehicles from going further up the hill. The impasse continued for about 10 hours until the police arrived. The tribal protestors returned home only after the vehicles retreated to the refinery two kilometres away. Niyamgiri Hills in the Eastern Ghats is at the centre of a power struggle between the Dongria Kondh tribals, who have lived there for generations, and Vedanta, a subsidiary of Sterlite Industries that has won rights to blast open the hills to take out its bauxite deposits. 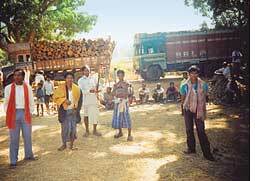 Activists fighting for the rights of the tribal people over the forest in Kalahandi district alleged Vedanta was trying to start covert mining operations without waiting for clearance from the Union Ministry of Environment and Forests (moef). "This is the second time in a month they (Vedanta) have tried to move heavy vehicles up the hill as their refinery is short on raw material. Last month also people stopped their vehicles," said Siddhartha Nayak, president of Kalahandi Sachetan Nagrik Manch. People have set up camps in the village to prevent attempts by the company to send its vehicles up for mining related work. The one-million-tonne refinery is operating below 50 per cent capacity, said company sources. But officials dismissed accusations of attempts to illegally mine bauxite. "There are rich bauxite deposits in Chhattisgarh and Gujarat from where we are getting our raw material," said Sasanka Patnaik, spokesperson for Vedanta Alumina. He said the heavy vehicles were sent only for road repair work. The five-metre-wide forest road is being widened to improve access to the mining site. The Supreme Court last year cleared mining operations in the Niyamgiri hills despite a Central Empowered Committee report that mining should not be permitted. It was a huge setback for the tribal people and human rights and environmental activists who have been fighting against mining in the Niyamgiri for more than four years. But the actual mining can commence only after a joint venture agreement is signed between Sterlite Industries and Orissa Mining Corporation. The company said it has obtained stage one clearance for "prospecting and controlled blasting to know the exact depth and quantity of bauxite deposits". Fresh applications for stage two clearance, for commencing mining work, will be moved soon, said Patnaik. He added that the company could not start prospecting as the special purpose vehicle (spv), for implementing the project, has not been created. The Supreme Court while clearing mining operations had mandated an spv to ensure environmental regulations are met. State industries secretary Ashok Dalwai confirmed that Vedanta has obtained stage one clearance but was categorical that prospecting can start only after stage two clearance for mining is obtained. The state minister for steel and mines Pradeep Amat said that the government "is still working" on the spv and joint venture agreements. Vedanta said it will comply with environmental stipulations and would soon deposit Rs 12 crore with the moef for diverting forestland for the project. Another Rs 20 crore will be deposited for peripheral development. Patnaik said 90 people from 125 displaced families have been employed in the refinery and 20 others were absorbed in executive positions much before the apex court order. "We are also helping the district administration to form women's self-help groups for income generation projects," he added. Notwithstanding the promise of livelihood opportunities for the displaced persons, tension prevails. Two persons from Raghunathpur village in Lanjigarh were recently caught trying to cut the water supply lines of the refinery. "They had lost their land and wanted jobs. We let them off on bail bonds," Lanjigarh sub-inspector B Nayak said. The forest road is under vigil round the clock in Semalbhatta village.